The first day of preschool or daycare is an exciting time for young children. It’s usually also an exciting time for parents, too! Sometimes, introducing little ones with food allergies and related conditions into a new environment can be scary. Depending on the severity of the allergy, even a bit dangerous. If this situation is one you’ll be facing soon, it is important to educate and remind your child’s teachers and caregivers about food allergy precautions and safety BEFORE they begin their new adventure. Remember, an ounce of prevention is worth a pound of cure! In this post we’re going to outline some simple steps that you can follow to make sure that the first day of school and the transition into a new environment is a safe one for your child. We think these steps will also give you some much-needed peace-of-mind, not to mention we think your little one’s teacher and/or caregivers will appreciate it! With each tip you will find additional suggestions on how to really set yourself up for safety success. Schedule a back-to-school check-up with your pediatrician and/or allergist. Why, you ask? This is the perfect opportunity to make sure that your current allergy management plan is still effective. For example, do you have enough epinephrine auto-injectors, if that’s part of your plan? The healthcare team will ask the questions experts think of to make sure you’re prepared. You can also let them know you’ll be asking the preschool or daycare about a care plan (more on that below). Start the discussion with the preschool or daycare team about creating an individualized care plan. Ask how the school can work with you to develop a written plan to ensure your child’s needs are met and he/she and participate and be safe at school. In the United States this is known as a 504 plan, and in Canada some provinces may require something like this. The school may ask you to provide medical information or other documents from your child’s healthcare team. In the US, a 504 plan (or accommodation plan) is a written plan that describes exactly how the school will ensure your child’s needs are met and allow your child to participate safely during all parts of the school day. A team at the school will ensure your child qualifies for a 504 plan. You may need to provide medical information and/or recommendations from your child’s allergist and/or pediatrician. If the team finds your child eligible, they will create a 504 Plan. Provide teachers and caregivers with brochures and information on your child’s allergy to prevent accidents. You’ve probably seen brochures like this at the allergist’s office or on websites for families managing food allergies. Why not grab one while you’re at the appointment you just scheduled, and put it to good use! These brochures are often written to help people who are less familiar with the condition to get a basic understanding. While you’re at it, write your child’s name on the brochure to make sure it stays in the correct file! Document your child’s food allergies and related conditions and any treatment plans in preschool or daycare paperwork. Many preschools, schools, and daycare operations have sophisticated systems to keep track of important items like this. Ask them in advance what you can bring to include in your child’s file (e.g. “Should I bring a printed document or a flash drive? Do you need copies of any medical records? Do you have forms I can fill out in advance?”). This way you can be certain that they have the information you want them to have in the place and format that will be useful for them. Scratch that one off the list! 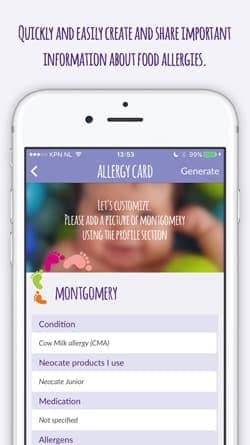 Create an Allergy Card. This is a one-page “cheat sheet” with information about your child’s food allergies and related conditions for substitute teachers or new employees. Your child’s teacher or caregivers will thank you! Make this cheat sheet short, simple, and to-the-point. Remember: it’s a cheat sheet, not a novel! You want it to get across important, relevant information quickly, and you want it to be read, not skimmed over. Are you considering using bold text, bright colors, and lots of exclamation points(!!!)? We’re not going to stop you! If you would like a simpler and more digital way to create your allergy card, check-out our Neocate Footsteps App. Have an in-person discussion about what to do in case of an emergency. This will be covered in your child’s 504 plan. It’s helpful when you provide information in writing, but a lot of adults learn well through verbal communication. This is your opportunity to really stress the most important points to your child’s teacher or caregivers. If they remember nothing else, they need to know what to do in an emergency. If your child will keep an epinephrine auto-injector at preschool or daycare, be sure to train the caregiver on when and how to use one. Train them on when to call 9-1-1, and make sure they have all of the important phone numbers for your family and your healthcare team. Make sure that your child fully understands what can trigger their allergy. We understand – lots of parents want to be with their child at all times to ensure their safety. Parents of children with allergies are no exception! Don’t worry; we won’t go so far as to call you “helicopter parents.” But if you haven’t had this conversation with your child yet, don’t wait! At preschool or daycare, your child will be away from you for several hours at a time in an environment that presents risk of exposure to allergens. Start now, don’t wait, and help your child to help herself! Look at upcoming lunch or snack menus and identify options, and provide the preschool with a list of foods that your little one can enjoy at any time. Many preschools and daycare operations have to plan their menus in advance and provide them to a state agency to ensure they meet certain nutrition standards. So don’t worry, asking them for a copy in advance shouldn’t require a lot of effort on their part! They will likely appreciate your help, too. Giving them a list of foods that don’t contain your child’s allergens at the beginning of the year could even help them with their menu planning! If no suitable menu options are available, pack food from home and make sure your child knows not to swap with his classmates. First, make sure they preschool or daycare knows you’ll be doing this, and ask if they have any requirements (they may require you label and date items, for example). Make sure to give clear instructions to the teacher or staff about storage, for example if your child’s lunch needs to be kept separate from allergen-containing foods. Last, explain to your child that he has his own special lunch, prepared with love by you! Offer to bring in allergy-safe treats for holidays and special events (if the school allows). This way you know that your child is safe, and she won’t feel excluded from the fun! (Some schools now do not allow fresh baked items, and require caregivers to bring in packaged items.) If parents are expected to provide treats for a holiday or birthday, consider a treat that doesn’t involve food for your child’s day. If treats are a regular occurrence, you can give the teacher or staff a bag with several treats at the beginning of the year so that they can use them one-by-one as needed for your child. For children that use a special formula, ask what you need to provide. Some preschools or daycares require formula to be brought to them already prepared. Others are okay if you proved pre-measured powder and clear preparation instructions. Have this conversation before your child’s first day so that you aren’t caught off-guard when you drop your child off. That would be bad! If your child uses Neocate Splash, you could always bring a few extra drink boxes to keep as an emergency supply. 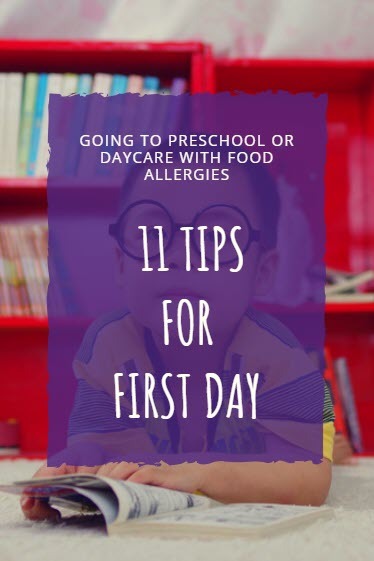 We’ve reviewed some of the top steps you can take to prepare for the first day of preschool or daycare for your child with food allergies or related conditions. Taking these steps will not only prepare her for success and safety on the first day, but throughout the year! We hope these tips are helpful to you. Start now, and check them all off! Do you have other tips to share for families facing the first day of preschool or daycare? Let us know what else you are doing to prepare your child for his or her first day so that we can share that with everyone! Are allergies more common in the US?